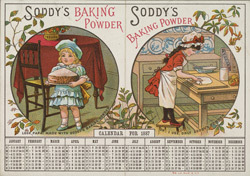 Baking powder was developed and marketed in the 1850s as a means of making bread without yeast. Housewives and cooks could make their own baking powder from baking soda and sour milk but the result was often quite unpredictable, and this readymade shop-bought powder transformed home cooking. This is leaflet showing two frill- and bow-bedecked children making cakes for their parents, an almost stereotypical scene of middle-class Victorian sentimentality.